February 10, 2014 was a great day at the Immaculata Monastery here in Norfolk, NE. The Sisters were celebrating the Solemnity of St. Scholastica, twin sister of Saint Benedict. St. Benedict is the Founder of the Benedictine Order. They were also celebrating the Golden Jubilee of two of their Sisters. 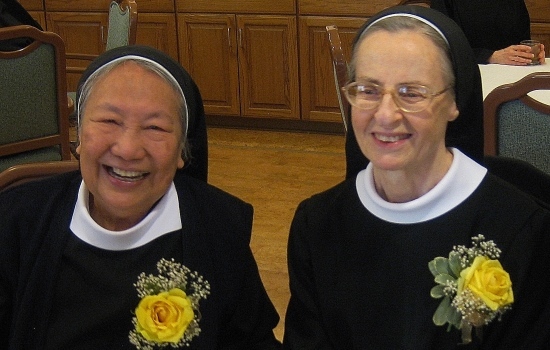 Sr. Antoninette, an American, and Sr. Barbara, a Filipino, made their initial commitment to religious life 50 years ago in their respective home countries. This year, their missionary journeys brought them to Norfolk, NE. When asked how it felt to be 50 years professed both sisters said they were very grateful and blessed. During the profession ceremony the Suscipe is sung. For Sr. Antoinette it has special meaning, “The more often we sing it, the deeper it roots into the heart.” It provides that response that she started 50 years ago. What led the sister to this life? Sister Antoinette said, “I suppose it began in appreciation of the Sister I grew up with as teachers.” She also credits her spirit of adventure to leading her to religious life. For the last 50 years both Sisters have been all over the world. Sister Barbara started her journey in the Philippines. She has since been missioned to Angola for 16 years, Tanzania (Ndanda) for one year, Uganda (Jinja) for 5 years and the United States. During her time in Angola, the country was under communist rule. In order to get food the sisters were given cards. One card for bread, one card for meat and so on. They would stand in line and wait to receive these items and sometimes waiting and not receiving any because of a shortage.